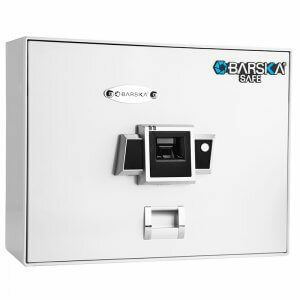 The Extra Large Biometric Rifle Safe from Barska is a great way to keep rifles and other firearms securely stored while allowing only select users access to the contents in seconds without the need for a combination or a key. 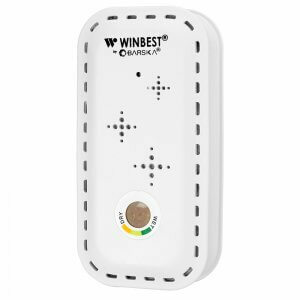 The advanced Biometric Fingerprint Identification System features an optical scanner that analyzes the scanned fingerprint and compares it to unique characteristics of those stored in the safes 120 fingerprint memory. Only those who have had their fingerprints registered into the Biometric Modules database will be able to open the safe. 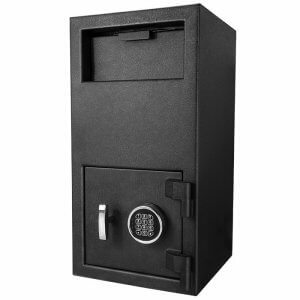 In addition to the fingerprint recognition technology, this safe is secured by a five-point dead bolt made of one-inch steel locks. The Extra Large Biometric Rifle Safe includes an adjustable 16 position rifle rack and 3 removable shelves that can be positioned to the users liking. As any firearm owner knows, keeping your firearms securely stored while retaining the ability to quickly access them in an emergency is extremely important. The Large Biometric Rifle Safe by Barska addresses this concern by providing a solid steel safe with advanced Biometric fingerprint scanning technology for the ultimate combination of security and accessibility. 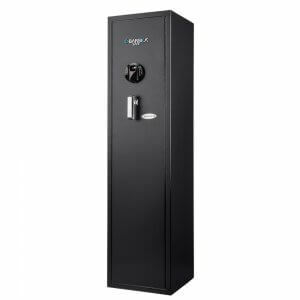 The advanced Biometric Fingerprint Scanner featured on the Extra Large Biometric Rifle Safe can store up to 120 unique fingerprints in its memory database. Fingerprints can only be programmed into the database with the assistance of a verified user, ensuring that no unauthorized fingerprints can be stored into the system. The Biometric Fingerprint Scanning System allows the safe to be accessed within a couple of seconds. 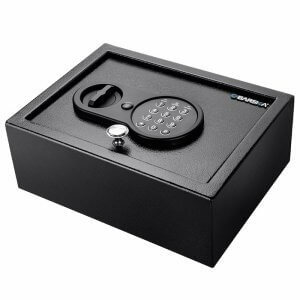 An optional Silent Access Mode is available for those who wish to have more covert access to their safe. 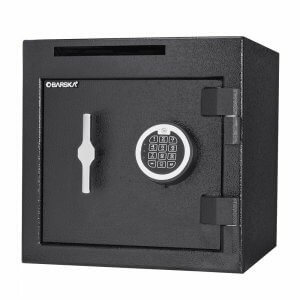 This safe also comes equipped with 2 back-up keys and an external battery pack in the event that the batteries go out. 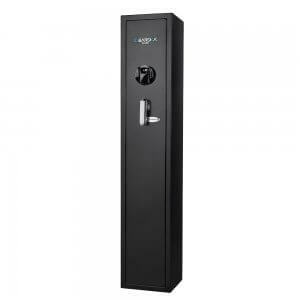 The Extra Large Biometric Rifle Safe is constructed out of solid steel, and provides enhanced security with its 5 point dead bolt locking system. 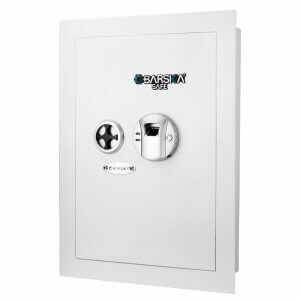 This Extra Large Rifle Safe has passed the rigorous tests performed by California Department of Justice (CA DOJ), and has been approved as a CA DOJ certified firearms safe. This means that the Extra Large Biometric Rifle Safe has proven to be tamper resistant and has held up to attempts to break in. 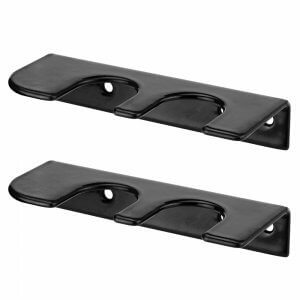 The Extra Large Biometric Rifle Safe also comes with 6 pre-drilled mounting points for anchoring the safe to a wall to further secure the safe and the valuables inside. Returns are subjected to a 30% restocking fee. If you need to return an item after the delivery has already been accepted, please call 1-888-666-6769 for an RMA number. Because of the size, I expected this to arrive a little beat up but the packaging was pretty flawless. I keep 3 rifles, 1 shotgun, 3 pistols, and ammo in this. I was worried that the biometrics wouldn't live up to the advertising but lo and behold, it actually works! And quickly too. All I really needed were some cosmetic upgrades like lights and better padding. Very happy with the purchase.